This is a big, big year for Primal Woods Pure Michigan Maple Syrup. As I have documented previously, we are in the midst of an almost 10 fold increase in production, which will probably be the largest increase in production we ever take on, at least in relative terms; 60 taps to 500, 15 gallons to 125 gallons of syrup. If all goes well, we should produce the equivalent of 2,000 half pint bottles. Every step in the process requires attention, from tapping to bottling packing and shipping. I walk step-by-step through the process and necessary improvements in the post Planning for 2018 Maple Syrup Expansion. Today though, the subject is Step 2: Tap Trees. Read on for more information on how to decide when to tap your trees! I was recently at Sugar Bush Supplies Co. in Mason, MI, picking up the bulk of the new production equipment required to support our maple syrup production ramp-up. When I asked what they were hearing about when folks were tapping in our neck of the woods, I was surprised to learn that some sugarers have been collecting since November of last year! I consider the season to be February-March, perhaps a late January start, perhaps an early April end; but the bulk of the season in February and March. These folks are using tubing, which we do not use, and have no plans to use. But, tubing has its advantages, and one is that it can extend the season. Applying vacuum to the tubing, and installing new spiles and drops every season, can reduce the build-up of bacteria and yeast in the tap hole in the late season, effectively extending the season and increasing sap flows. To learn probably more than you want to know, you can have a look at the Tubing Notebook, published by Cornell University. With buckets for sap collection, I reckon the season is 4 to 6 weeks in length, before either the bacteria and yeast catch up with us, the tree seals off the wound with new wood, or a combination of the two. So, where should we put that 4 to 6 week window on the calendar? I have a lot of time for Les Ober over at the Ohio Maple Blog, and he published a post on this subject just yesterday, titled When to Tap? After reading that I went to Accuweather and looked at the long range forecasts for our 49057 zip code, and from that data I produced in Excel the chart at the top of this post. Remember, the temps need to be cycling, with daytime highs above freezing, preferably 40-ish, Fahrenheit, and overnight lows below freezing, preferably 25-ish. 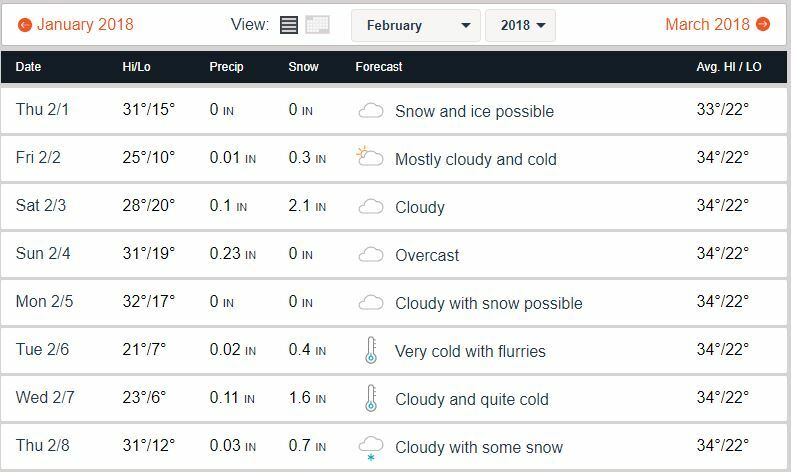 From Accuweather it looks like February is expected to be a bit colder than average (YES! More time, thank you! ), which means I can push the date out at least relative to last year, when I tapped February 7th. The back-end of the window is set at 5 weeks from the front end, right in the middle of the 4-6 week window for buckets discussed above. Between now and February 14, I’ll keep my eye on the 10-day forecast. So far I’d say it is still too early to tap; not enough daily cycling above and below freezing. If you want to see what this 10-day forecast should look like in the near perfect world, check out my post It is Tapping Time and That Means Spring! from the 2015 season. The good news, and it’s all good news, is that it looks like I have about 3 weeks to complete preparations for the 2018 Primal Woods Pure Michigan Maple Syrup season. With the Sugar House conversion project, and a new evaporator, filter press and canning unit all requiring my attention, every bit of that 3 weeks can be used effectively. Keep an eye on this space for more information on the preparations being made, particularly in the “new” Primal Woods Sugar House!